Born in Puerto Rico and raised in New York City, E.J. Rodriguez learned to play by listening to his mother’s Latin jazz favorites, practicing on his older brother’s congas and jamming at the Rumba on Sundays in New York’s Central Park. He has studied Latin and Afro-Cuban polyrhythms in Brasil and Cuba and his birthplace, Puerto Rico. 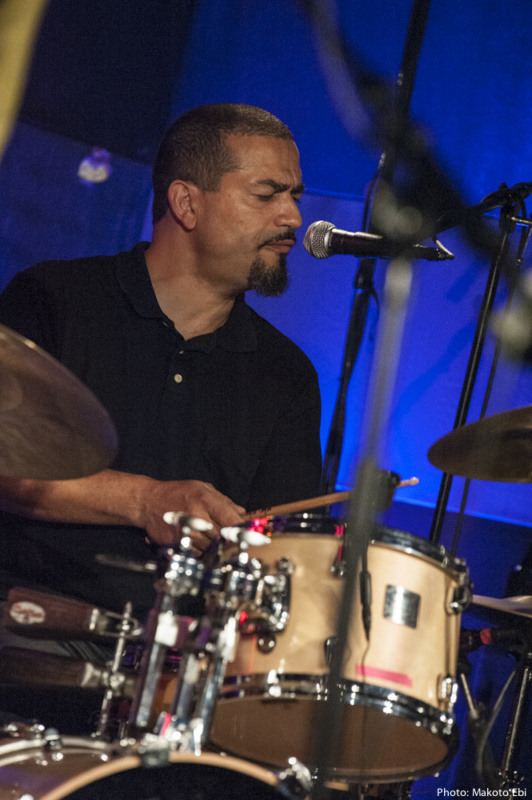 EJ has played with groups such as The Jazz Passengers, The Lounge Lizards, The Brooklyn Funk Essentials, and Marc Ribot Y Los Cubanos Postizos. EJ has also appeared in films such as Claire Denis’ Keep It For Yourself, The Prince of Central Park starring Kathleen Turner, and Coffee and Cigarettes by Jim Jarmusch. EJ splits his time between Phoenix, Arizona and New York City where he can still be found occasionally sitting in on a Sunday afternoon Rumba. His songs and style are inspired by the music of his native Puerto Rico and Afro-Cuban Folklore. Los Papines, Los Muñequitos De Matanzas, and his teachers Little Ray Romero, Frankie Malabe, Changuito and Pancho Quinto.